Despite the agreement to extend the debt ceiling, politics remain unpredictable. Citi analysts suggest that investors look beyond the debt ceiling and focus instead on earnings, where the current trend looks promising. Citi assumes that the 3-month extension will be passed through Congress but this just delays the issue. 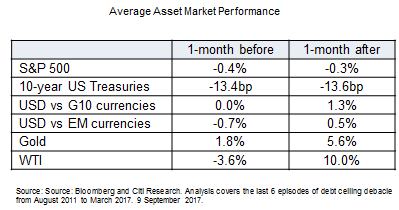 Given the unpredictable nature of US politics, Citi analysts have looked at the market impact of the last 6 episodes of debt ceiling debates between August 2011 to March 2017. See table. Citi assumes that the 3-month extension will be passed through Congress but given the unpredictable nature of US politics, investors may be interested to understand the market impact of past debt ceiling debates. See table. However Citi analysts caution investors from reading too much into these numbers as they would have been influenced by the prevailing macro factors and monetary policy settings at that time. Citi analysts suggest that investors continue to focus on earnings. On this front, the current earnings trend looks promising. In the US, the year on year earnings growth is at its highest since 2012. In contrast to previous years, the 12-month trailing earnings for all regions are beating expectations set at the beginning of the year. The global growth picture is helping the earnings story. All major economies are growing in 2017 and Citi analysts expect the current phase of synchronised growth to extend to 2018. Against this backdrop, equities and cyclical sectors are likely to outperform. Returns are however going to be more muted over the next 12 months given the rallies to date. Concerns over balance sheet reductions by central banks as well as geopolitical tensions may cause periods of market volatility. Investors are encouraged to stay invested but diversified to buffer against short term market fluctuations.